You might be surprised to learn that polenta, the classic Italian side dish made from coarse ground yellow corn, is now acceptable at any meal of the day, because it wasn’t always this way. In fact, it wasn’t always made from ground yellow corn. Before corn was imported to Europe in the 16th century, polenta was made with whatever grains were available locally. The grains were dried, ground, and then boiled in water until they had a porridge-like consistency. So when corn finally made it to Italy, the perfect polenta grain was found: Corn added a sweetness that other grains lacked, and it also had enough structure to stand up to the slow, hours-long cooking process without turning to mush. Though polenta was seen as peasant food, the addition of corn elevated the dish and it became popular all across the country, quickly becoming a starting point for many classic entrees. And you may be thinking, 'Polenta just sounds like grits made in Italy.' And you wouldn’t be wrong. While grits are traditionally made from white corn and ground more finely, the cooking process is the same, and the final products have a lot in common. So next time you’re at the store, pick up some polenta and cook it up. Substitute it anywhere you would use grits. From breakfast to dinner, it is sure to add a little something to your next meal. In this episode of Cooking with Fire, Josh Cary and Chef Tom Jackson prepare Creamy Breakfast Polenta. Cook the four strips of bacon in a 12” cast iron skillet, over medium flame. When the bacon is cooked to desired doneness, remove from the skillet. Add the diced onions to the skillet and cook in the bacon fat until translucent and softened. Add the minced garlic and cook one minute, stirring. Add the water and milk and bring to a simmer. Slowly pour the cornmeal into the liquid, whisking constantly. Continue whisking to prevent the polenta from becoming lumpy. Add the fresh thyme and continue stirring. Cook until the polenta is tender, about 10 minutes, stirring frequently. Turn the heat to low. Season the polenta with smoked salt and fresh ground black pepper, to taste. Add the cheese and butter and stir until incorporated. Cover with a lid. Turn the heat off. To poach the eggs, fill a sauce pan with about 4” water. Bring to a boil. Turn the heat down. Stabilize the temperature of the water just below a simmer. Crack the eggs into a bowl, two at a time. Be careful not to break the yolks. Gently lower the bowl of eggs into the water and transfer the eggs into the hot water. Cook for three minutes. Remove the poached eggs from the water with a slotted spoon. 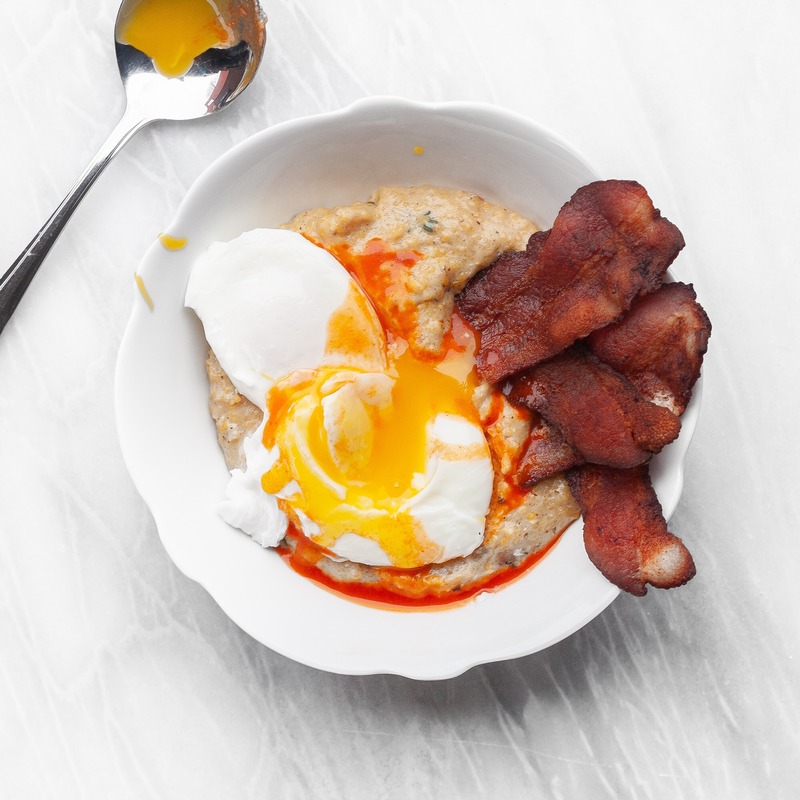 Serve the creamy polenta with the bacon and poached eggs. Add hot sauce, as desired.